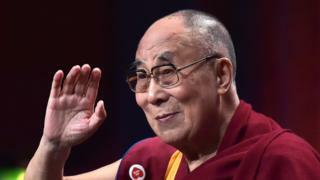 The Dalai Lama has been discharged from a Delhi hospital, three days after being admitted with a chest infection. The Tibetan spiritual leader, 83, had suffered from a "light cough" but was "doing very well", his spokesman said. The Dalai Lama fled to India 60 years ago as Chinese troops crushed an attempted uprising in Tibet. He lives in exile in the city of Dharamsala. He was awarded the Nobel Peace Prize in 1989 for his opposition to violence in his quest for Tibetan self-rule. "He was discharged from the hospital at eight o'clock in the morning (02:30 GMT)," his spokesman Tenzin Taklha told AFP news agency on Friday. The Dalai Lama is expected to spend several days resting in Delhi before returning to Dharamsala. China, which took control of Tibet in 1950, views the Dalai Lama as a dangerous separatist. The question of who will succeed him when he dies is highly contentious. China says its leaders have the right to choose his successor. But last month, the Dalai Lama reiterated that any leader named by China would not be accepted by Tibetans.